Al Pacino has been spotted on the set of Martin Scorsese's The Irishman in Suffern, New York. Robert De Niro and Joe Pesci were first seen filming back at the end of September, but Pacino has not been seen until now. The 77-year old Al Pacino was filming scenes with 74-year old De Niro and the two appear to be enjoying their reunion as they can clearly be seen smiling in between takes. De Niro has worked with Pacino on 1995's Heat, 2008's Righteous Kill, and they were both in The Godfather Part II, though they never appeared on screen together. Martin Scorsese and Robert De Niro have made eight movies together, one of the most fruitful and consistent creative partnerships in Hollywood history. Joe Pesci has had supporting roles in three Scorsese pictures including Raging Bull, Goodfellas, and Casino. Shockingly, Scorsese has never worked with Pacino before, despite the actor's role in one of the greatest crime sagas not made by Scorsese, The Godfather. Pacino plays Jimmy Hoffa, who served as the President of the International Brotherhood of Teamsters union and was also involved with organized crime. Hoff mysteriously disappeared in 1975 at the age of 62. The Irishman is based on the 2003 book, I Heard You Paint Houses, by Charles Brandt, which recounts the years Frank "The Irishman" Sheeran (Robert De Niro) spent as a mob hitman. Brandt interviewed Sheeran over a 5-year period, during which the mobster confessed to being involved in more than 25 hits for the mob. Sheeran was allegedly (detectives do not believe that he was responsible) involved in the death of legendary mob boss Jimmy Hoffa (Al Pacino), who went missing in July 1975 and was never found. The Irishman is the first gangster movie that Martin Scorsese has made in over a decade and was reportedly good enough to get Joe Pesci out of retirement. The Irishman will have Frank "The Irishman" Sheeran as an older man, looking back at his life and his mob hits that made him infamous. In order to tell the story realistically, Martin Scorsese is teaming up with George Lucas' VFX company, Industrial Light and Magic, to utilize the same effects used on Brad Pitt in The Curious Case of Benjamin Button so that De Niro can be digitally aged to look younger in the flashback scenes. The Irishman will include flashbacks that span decades, and De Niro is set to play Sheeran in all of them. He'll reportedly appear as young as 30 years old in the movie. There is no official premiere date for Martin Scorsese's The Irishman yet, but production is expected to wrap in December. One has to imagine that applying the CGI de-aging effects in post-production will take quite a while, so we might not see the movie for a while. That being said, Scorsese intends to have The Irishman have a short theater run so that it can be /new-movies-online-sooner-theatrical-release-window-shortening/considered for awards season. 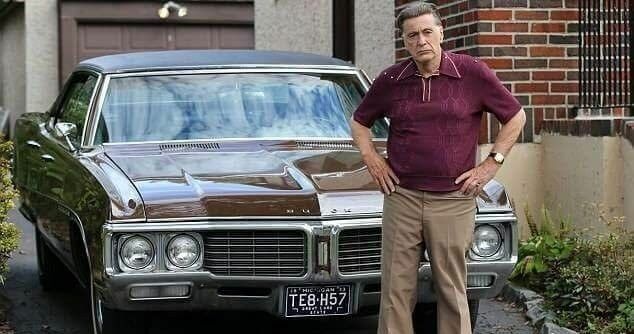 In the meantime, check out some new pictures of Al Pacino as Jimmy Hoffa on the set of The Irishman courtesy of the ExperimentalFilmSoc's Twitter account below.